The overjustification effect is a well replicated phenomenon in which an expected external incentive (e.g. a financial bonus or prize) for doing something reduces a person’s intrinsic motivation to complete a task. Intrinsic motivation comes from within and is often linked to three important drivers of behaviour; autonomy, mastery and purpose. In his book Drive, the American psychologist Daniel Pink, argues that a focus on extrinsic rewards (i.e. external incentives) can deliver short-term results, but it is difficult to sustain. This is because such incentives don’t help mastery which is an important source of achievement and intrinsic motivation. A reward for completing a task whether or not it is done well may reinforce the feeling that the task isn’t worth doing for itself. It positions all the satisfaction in the future, when the reward will be received, turning the task into a chore that has to be done first. It takes all the joy out of undertaking the activity. In 1973 Lepper, Greene and Nisbett conducted research in a nursery school to understand how intrinsic motivations are influenced by extrinsic rewards. The researchers asked 3 to 5 year-old children to play and draw using felt-tipped pens. Children were allocated into one of three groups. Here children were offered a “Good Player” ribbon for taking part in the activity which involved the user of felt-tipped pens. In this group children were only told about the reward they would be receiving until after the activity had finished. This was the control group as they were not informed or given any kind of reward. Afterwards children were observed in a free-play environment to see if there was a significant difference in the number of pupils still taking part in the activity. The research confirmed that those children who were promised a reward played significantly less with the pens on the next occasion they were observed. However, there was no change in the behaviour of those children who unexpectedly received the reward until after performing the activity or those who did not receive any reward at all. However, research at Southern Methodist University found that there is a way to prevent the overjustification effect. Provided people are intrinsically motivated by a task the study indicates that when people are rewarded based upon how well they complete an activity, and this is clearly communicated, rewards can produce that pleasure of intrinsic validation. The higher the reward, the more intense the feeling will be and the more likely they will be motivated to put more effort into the activity next time. The research suggests that rewards don’t motivate people to work harder unless they are linked to how well they perform a task. Money alone doesn’t achieve that as it becomes a transactional relationship and we can feel we are simply being paid off or coerced. Rewards based upon how many times we play a game or reach a set goal can make us feel like a machine. Money should only be used as a reward if it is unexpected and in addition to compliments and praise about competency for doing a good job. This allows people to explain their behaviour based upon motivations that come from within and not that they were doing it purely for the money. The implication for gaming is that achievements and rewards that are purely linked to repetition (e.g. number of hands played) or completing set tasks (collect 10 standard Pokémon’s) will actually harm intrinsic motivation. If this happens a player’s motivation then becomes reliant on extrinsic rewards (e.g. bonuses and trophies) rather than the game they love. This suggests that poorly thought out achievements and rewards may damage player motivation in the long run. The danger here is that if the extrinsic rewards are not compelling enough or run out the player will quickly lose interest and go elsewhere for their fun and enjoyment. 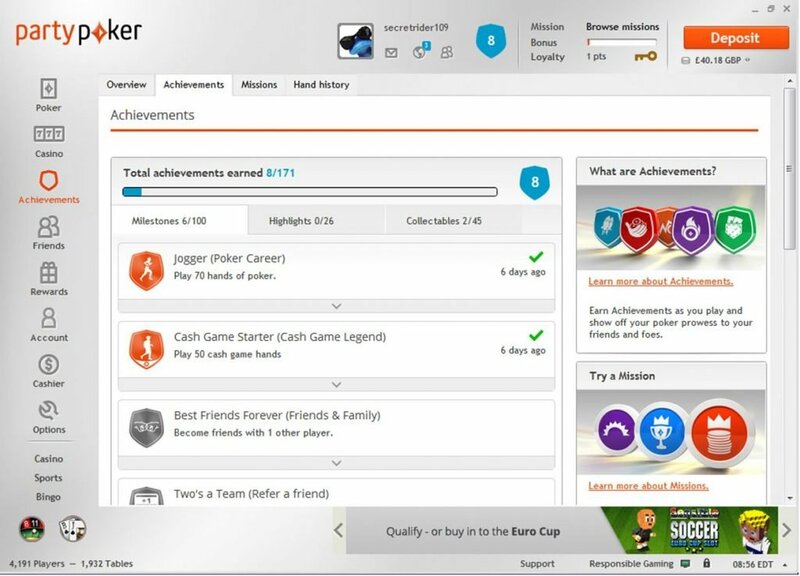 Many of the achievements on the partypoker.com site shown above are purely related to repetition and have no link to competency. Gaming companies will have more success if they ensure that achievements and trophies are linked to how well players perform and should praise and reward improvements in game competency. Poker and conversion – How can poker boost your conversion rate? Bonuses – The secrets of optimising gambling sites!